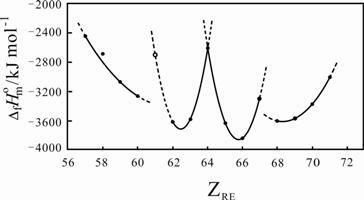 The constant-volume combustion energies, ΔcU, have been determined for 15 solid complexes of rare earth chloride with glycine by a precise rotating-bomb calorimeter. The standard molar enthalpies of combustion, ΔcHmΘ and standard molar enthalpies of formation, Δf HmΘ, at T = 298.15 K have been calculated for these complexes. The relationship of Δf HmΘ with the atomic numbers of the elements in the lanthanide series has been examined. The results show that a certain amount of covalence is present in the chemical bond between the rare earth and glycine. Furthermore, corresponding Δf HmΘ of Pm(Gly)3 Cl3 ·3H2O was estimated as -2698 kJ·mol -1.